Energy equals mass times the speed of light squared, E=mc2. When people think about this most popular of physics equations, they usually think of the awesome release of energy so starkly demonstrated in the mushroom cloud of an atomic blast, which is matter converting to energy when a uranium-235 nucleus breaks apart. 2.2 pounds of uranium yields 18.7 million kilowatt-hours of energy in a fission reaction, enough energy to power 2,100 100-watt light bulbs for ten years or one light bulb 21,000 years. Perhaps the spectacular nature of this reaction is why so few people realize that the transformation flows both ways through the equal sign of Einstein’s equation. In fact, for much of the Universe’s history the conversion has gone the other way, energy becoming matter. 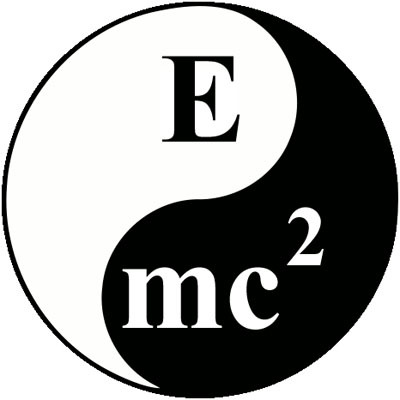 E=mc2, but just as often m=E/c2. Mass equals Energy divided by the speed of light squared. Let’s go back to the beginning of all existence. Pop. A single point explodes into what we call the Big Bang. At 10-43 of a second the universe had diffused enough energy for the force of gravity to emerge (10-43 of a second is 0. [insert 43 zeros here]1 or 1/1[insert 43 zeros here] of a second). From 10-33 of a second to 10-5 of a second quarks and anti-quarks, the sub-atomic particles that make up atomic particles, condensed out of the energy soup. These quarks and anti-quarks condensed into protons and neutrons at 10-5 of a second. Three minutes later, these condensed into 75% hydrogen and 25% helium nuclei, the centers of atoms. 300,000 years later, the universe has cooled enough for hydrogen nuclei to begin capturing electrons into their atomic orbits, forming the first atoms. 600 million years after time started from zero, hydrogen clouds condensed into masses so great that they build enough pressure for gravity to fuse hydrogen nuclei together into helium atoms. The four hydrogen atoms have a combined mass of 4.0312 amu (Atomic Mass Units or 1.67377 x 10-24 of a gram), which become a single helium atom with a mass of 4.0026 amu and two positrons of 0.00055 amu each. 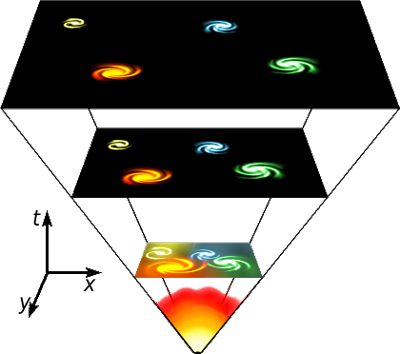 The 0.0275 amu or 0.007 percent difference in masses is converted to energy according to E=mc2 and stars begin to ignite in fusion reactions, hatching from the hydrogen clouds, and the first galaxies condensed into being. Within the awesome pressure of stars, hydrogen atoms fuse into helium, helium fuse into carbon, carbon into neon, into oxygen, and then silicon, each fusion reaction marching up the periodic table all the way to iron. Starting from hydrogen’s atomic mass of 1.00794 amu, stars force matter together into iron’s atomic mass of 55.845 amu. Because the fusion reaction that generates iron produces no excess energy, and in fact absorbs energy, iron is the last element that can be formed inside a star’s core. Stars sufficiently saturated with iron collapse in on themselves, and then, like a hammer striking a rubber ball, rebound suddenly and violently in a explosion known as a supernova. This dramatic celestial phenomenon produces all the heavier elements that exist in the Universe today. Occasionally, a star is too massive and its collapse too strong for it to rebound, and it continues to collapse into a point of infinite density and zero volume known as a black hole, a point so gravitationally dense that light cannot escape it and time practically comes to a stop in its vicinity. As the matter in our Universe grows denser, black holes will become more prevalent and stars will wink out of existence as all energy either freezes into matter or diffuses into a state of uniformity, but that’s still a trillion years in the future. The more mass, the more potential energy. There is 300,000 kilometers per second multiplied by 300,000 kilometers per second multiplied by our individual mass of that capital letter “E” concentrated in all matter. We and everything around us is the lower-case “m,” and we are equal to E/c2. “…rebound suddenly and violently in a explosion known as a supernova. This dramatic celestial phenomenon produces all the heavier elements that exist in the Universe today.” <== This is the sort of scientific idea that made me appreciate the movie The Fountain more, particularly the themes of life and death illustrated by the so-called Xibalba nebula in the story. I loved the comparisons to seeds; and that many of the seemingly violent deaths on grand and small scales are just fertile grounds for new life. Izzi: The Mayan guide I told you about. Tom Verde: From your trip. Izzi: Yeah. The last night I was with him, he told me about his father, who had died. Well Moses wouldn’t believe it. Izzi: [embraces Tom] No, no. Listen, listen. He said that if they dug his father’s body up, it would be gone. They planted a seed over his grave. The seed became a tree. Moses said his father became a part of that tree. He grew into the wood, into the bloom. And when a sparrow ate the tree’s fruit, his father flew with the birds. He said… death was his father’s road to awe. That’s what he called it. The road to awe. Now, I’ve been trying to write the last chapter and I haven’t been able to get that out of my head! Tom Verde: Why are you telling me this? Ohhh… That’s nice. I gotta queue that film to my netflix now. Good movie! One of the rare ones worthy of a 5 star rating. Thanks Gnixon! I’ve updated the credit to include Fredrik! From the beginning of time, we have pondered the complexity of our Solar System, and marveled at its beauty. In the past, the perception of our sun and planets was as though we had been looking outside from within, through disjointed facets of an awe-inspiring gem. Over the millennia, this gem has slowly come to light, and those facets have been pieced together to reveal an astonishing view of reality. Good and evil play out among the planets, and our Solar System is much more than an ordinary star surrounded by worlds. It is the Heavenly Tabernacle of God. For the first time in human history, the mysteries of the universe are unlocked for our understanding as religion, science, and our own experience as cognitive dreamers are brought together to reveal what really goes on between Heaven and Earth. This is the truth about creation for which we have all been waiting. Fire Rider gives real answers to real questions about our existence. We will learn how the physical and spiritual realms coexist. We will understand why God had to come to Earth to die. We will know how Lucifer and those who decided to follow him gained the power to possess humans. We will also see, through Planetary Orbital Jumping, how our Solar System is poised to dispatch some of the righteous to other star systems in order to become the seeds of new civilizations. In the end, we will feel the love and grace of God burning in our hearts like a fiery spring reaching out to fulfill His eternal purpose for our lives. In order to explain reality, we must correctly interpret the interchange between various types of languages. The languages we speak, the language of mathematics, and the language of dreams must be properly laced together to make sense of a reality we normally do not understand until death. Hebrew and Greek were used to write the Bible because they are the two most perfect languages in existence. From the beginning, Hebrew and Greek were intended to reveal the mysteries of God. Hebrew was used to write the Old Testament to establish the historical facts. Greek was used to write the New Testament to reveal God to us, and support mankind with very clear-cut definitions of the terms we need to guide us through life, and teach us about reality. Religion is the impetus that engenders understanding, so this preview will begin with religion and finish with science and dreams. The word “religion” means to reconnect to the legion of God. To reconnect us, God uses many different media. One of the most significant is the symbology of the Earthly Tabernacle established at Mt. Sinai during the exodus of the Jewish Nation from Egypt. Our first notion of a literal dwelling place for God came in 1446 B.C. when God Himself gave the Earthly Tabernacle layout directly to Moses. Its design was intended to mirror the true Heavenly Tabernacle. Hereafter, the structures and furniture of the Earthly Tabernacle will be referred to as artifacts, since some of them remain as religious relics to this day. Only seven artifacts will be described briefly and matched to their heavenly counterparts. Then, the spiritual relevance of the heavenly counterpart will be given to complete the analogy. The Earthly Tabernacle was laid out East to West. It was a portable Holy Temple with an outdoor slaughter area for sacrificing animals. By comparison, our Solar System is a mobile Holy Temple where both God and Satan live and dwell. Christ came down from Heaven to be sacrificed on Earth, and the artifacts of the Earthly Tabernacle reveal exactly where He came from, and where He went after His resurrection. The first artifact is the courtyard gate. It was oriented toward the rising sun in the East. The Earthly Tabernacle gate, a doorway for the privileged priesthood, represents the sun. The sun is our spiritual gateway to the universe. Looking west, the second artifact is the Altar of Burnt Sacrifice. The Altar of Burnt Sacrifice, where animals were killed and cooked for eating, represents Earth. Just as animals were killed and became food at this altar, Jesus was killed on Earth and became known as the Bread of Life for our souls. Continuing west, the third artifact is the Bronze Laver. Like the Altar of Burnt Sacrifice, the Bronze Laver was outside in the courtyard. It was used by the priests for ceremonial washing. The Bronze Laver represents Jupiter. Just as we bathe ourselves, our dreams spiritually refresh us during out-of-body experiences. Our dreams are out-of body, bi-location experiences that ordinarily begin on Jupiter. Next, we find the tabernacle structure itself. The door of the tabernacle represents a pivotal boundary between Jupiter and Saturn where Planetary Orbital Jumping has its engine. Planetary Orbital Jumping is both the physical and spiritual engine for catastrophic changes that must take place three times during the lifespan of our sun. Next, we enter the tabernacle structure to find the fifth artifact, the Altar of Burnt Incense. The Altar of Burnt Incense represents Saturn. Saturn is where Satan’s spiritual throne is found. After the Altar of Incense, we find a curtain called the Tabernacle Veil. The Tabernacle Veil represents our spiritual access to Uranus and Neptune. Surprisingly, the Veil also represents the limit of human visibility to see celestial bodies within our Solar System using the naked eye. Uranus and Neptune are visible with the naked eye from Earth, but quite hard to spot at times. Beyond the Tabernacle Veil, we find the Most Holy Chamber where God spoke to the high priest once a year through a ball of light from a position just above the Ark of the Covenant. The Ark is a large golden box with a lid upon which two golden angels rest. Just as God spoke from between these two angels to the high priest once a year, He now speaks regularly to His people from His position on the Most High Heavens — Uranus and Neptune. The two angels on the Ark of the Covenant represent Uranus and Neptune. Neptune is where Christ’s spiritual throne is found. Spiritually, Neptune is the right hand of God the Father. Through the symbology of the Earthly Tabernacle, God has shown us that He left His Most Holy Chamber — Uranus and Neptune, to come to Earth to set an example for mankind as to how to live righteously. Then, He died and resurrected in order to save those who believe in Him. The Earthly Tabernacle demonstrates God’s willingness to teach us about the more important Heavenly Tabernacle. The true Heavenly Tabernacle is our Solar System. The gas giants Jupiter, Saturn, Uranus, and Neptune are spiritual abodes that can migrate between orbital geometries to fulfill God’s eternal purpose, both for our lives and for the worlds on which we live. Through Planetary Orbital Jumping, God will use the gas giants to regenerate the bodies of those who have died since the deaths of Adam and Eve. The languages God uses in the Bible took generations to be laced together for our understanding, and now we know what to look for and learn. The Hebrew text repeatedly states something that does not come to light until we read about it in the Greek. “Shamayim” is the Hebrew word for Heaven. It describes the expanse above the Earth to include the atmosphere and the entire universe. Dozens of times, the Hebrew text states that “God stretched out the Heavens.” From the information passed down by Noah and his descendants, the writers of the Old Testament knew that the planets, which they understood to be wandering “stars,” had somehow been “stretched out,” or moved to a more distant location from Earth at the time of Noah’s flood. They did not realize that Jupiter had migrated closer to Earth while Saturn, Uranus, and Neptune had migrated farther away. The Greek text uses the word “Ouranos” to describe the Heavens. “Ouranos” describes the Heavens as the spiritual abodes — Jupiter, Saturn, Uranus, and Neptune. The Greek text states that the Heavens will be “rolled up like a scroll” and “folded up like a cloak.” When God inspired the writers of the Bible to state that the Heavens were “stretched out,” and will be “rolled back,” He was giving us clues to discover Planetary Orbital Jumping. This behavior of planets migrating between orbital geometries is similar to electrons jumping orbit in quantum mechanics. This is what unifies religion with science: Heavens migrating away from the sun and then returning to their original orbits are similar to electrons jumping to higher orbits away from the nucleus of an atom, and then returning back to their original orbits. The only significant differences between the two are the obvious scale permutations, and the amount of time required to actually change orbital geometries. electrons return to their original orbits around the nucleus of an atom. For electrons, jumping from an undisturbed to a disturbed state and then back again happens many times a second. For the Heavens, one complete cycle from undisturbed to disturbed, and then back again happens over a period of five millennia between 2311 B.C. and 3033 A.D. Instead of releasing frequencies of the electromagnetic spectrum, however, Uranus and Neptune will release all the souls of the righteous who have died on Earth since Adam and Eve. As saints, we’ll all be coming home to both Earth and Venus! Noah’s flood occurred in 2311 B.C. Prior to this time, our star system’s configuration was quite different. Neptune was the closest gas giant to the sun, followed by Uranus, Saturn, and Jupiter. Their order was just the opposite of how they appear today. A unique planetary alignment occurred in 2311 B.C. that caused Uranus to migrate away from the sun drawing Saturn and Neptune with it as they pivoted in relation to Jupiter. This pivoting is described in part by an article in Sky and Telescope Magazine called Depleting Outer Asteroids, June 1997. Jer Chyi Liou, of the NASA Johnson Space Center, and Renu Malhotra of the Lunar and Planetary Institute, noticed that when you plot the distances from the sun of all the asteroids, you see at certain resonances that there are a lack of asteroids where logic dictates asteroids should be present. Because of their size, Saturn, Uranus, and Neptune accreted almost all of the asteroids at certain areas when they were inside the orbit of Jupiter. This means that around 2311 B.C., Jupiter migrated closer to the sun as Saturn, Uranus, and Neptune migrated farther away. The unification of quantum mechanics and heliospherics enables us to make predictions about the future. Hereafter, the Solar System will be referred to as a region of solar dominance known as the heliosphere. Heliospherics is the study of Planetary Orbital Jumping. Orbital jumping calculations for electrons can be extrapolated with great accuracy to orbital migrations of gas giants. The predictability of electromagnetic waves flowing away from atoms can be extrapolated to souls moving between celestial bodies. The link between quantum mechanics and heliospherics is that our souls behave like the photons and certain other particles of quantum physics. The laws that regulate quantum operations are part of the same hierarchy that separates one soul from another in our heliosphere. Spiritual phenomena, which I will often refer to as spiritual prerequisites, are simply divine procedures that have their roots in quantum behavior. It’s not that God and His operations can be reduced to quantum theory. It’s more like His creations are universally similar to the point of predictability. Dreams are out-of-body experiences that take place on the spiritual abodes. The more lucid a dream is, the higher we have traveled to one of the Heavens. A lucid dream is a cognitive neuro-physiological bi-location phenomenon. It is our quantum gravitational link to God, the gas giants, and the entire universe. smaller shell. In other words, as gravitational shells get larger they become weaker. Now, imagine two shells intersecting far above the north sides of two planets far apart. Let’s put Earth on the left, and Jupiter on the right. From the intersection far above and halfway between each planet, follow one of Jupiter’s shells as it passes through the North Pole of Earth. Jupiter’s gravitational shell that passes through Earth’s North Pole is the first leg of our journey. Traveling from Earth’s North Pole up along one of Jupiter’s gravitational shells, we intersect one of Earth’s gravitational shells that pass through Jupiter’s North Pole to continue down to Jupiter. In other words, we ride another celestial body’s arc, from our North Pole until the two arcs meet, and then ride our own celestial body’s arc down to the North Pole of the destination world. This is what we do every time we dream. We travel along these arcs effortlessly without even knowing where we are, or when we do it. When we die, we simply leave our physical bodies, and where we go depends on whether or not we believe in Christ. If we believe in Christ, we go directly to Uranus and Neptune. If we do not believe in Christ, we either go to Hell at the center of the Earth, or to Jupiter or Saturn depending on the darkness of our souls. These gravitational shells are the fires of creation that God has established for spiritual travel. We are the “Fire Riders” of gravitational fields that carry us faster than the speed of light between worlds. The shortest distance between two points is a straight line, but the quickest way to get there is on these arcs of space-time curvature where we travel at the speed of thought! heads of millions of people. I saw people packed like upright sardines standing on the interior of the Third Heaven. Uranus is a beautiful, green, grassy, crowded place where people wait to return to Earth. Upon leaving Uranus, I saw the Milky Way Galaxy in its awe-inspiring splendor. It’s a most wondrous sight to behold. As we approached Earth, my guardian angel let go of my hand and veered off to the right on his way back to Heaven. I then found myself standing in what appeared to be a station over the North Pole. There were people everywhere coming and going between Earth and the Heavens. I was still lucid being energized and invigorated by my travels. As I was looking down at the Earth, I found myself waiting for my physical body to spin around to me. Then zoom, in a flash of light, I entered the top of my head. My physical eyes popped open immediately, and I heard the key in the kitchen door unlock as my girlfriend was entering the house. My first thought was that I had just spoken to someone who had died a long time ago. Most of all, I had a feeling of euphoria because of the realization that life involves traveling to the gas giants in dreams and out-of-body experiences. I had traveled over a vast distance faster than the speed of light, and it was forceful and convincing in a most graceful and enlightening way. Although I was out of my body for what seemed to be a long time, it was really just a few minutes due to traveling at the speed of thought. we actually arrive before we left and have to wait until the time we departed to re-enter our bodies. It’s all part of living in the spirit, and can even be induced by causing the pineal gland to release dimethyl tryptamine into the blood stream, but this practice is not recommended. Instead, let God orchestrate your out-of-body experiences for a safe and prosperous journey because that’s how He did it for me, and in the process I discovered that Venus is the “star” of Bethlehem. It will migrate to an orbital geometry near Earth where it will become a pristine habitable world like Earth was before Noah’s flood! Venus is germinating like a seed waiting to be transplanted near Earth where, upon sister worlds – Earth and Venus, we will walk and talk with Christ Jesus!